The New York Yankees have had issues developing offensive farm talent for the better part of two decades, at least in using that talent to help its own roster. Much has been written about the potential prospect battle at second base but it quickly had cold water tossed on it when Stephen Drew was brought back in the mix. While the roster has trended significantly younger this winter, New York still has performance and health concerns and the most promising offensive talent at the higher levels of the minors in years. Let’s look at which of the Top 10 Yankees prospects could make it to the majors this year or next and why it could happen. There are six other prospects in the top 10 but either due to playing a blocked position, not being ready by the end of 2016, or being lower ranked than the prospects listed, they were not included on this list. Why: Because the Yankees have a lot of health concerns in its rotation and Severino has been fast rising. The top Yankees’ prospect went through two levels and made it into AA by the end of last season, not struggling at any point during his journey. 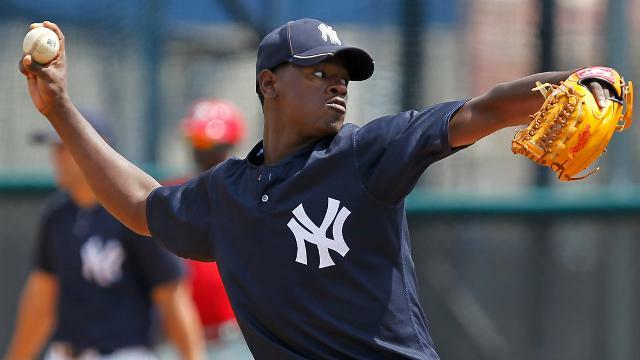 Severino, a right-handed starter, was unknown going into 2013 but could be in the majors as early as 2016 (unlike Ian Clarken, a top 10 prospect who is likely still a few years away) when he would still be only 22-years-old. 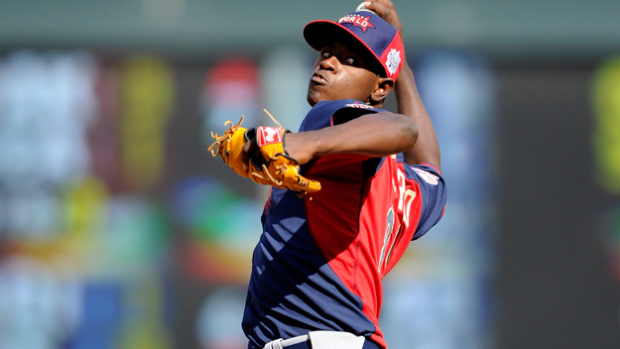 With three quality pitches and a fastball capable of reaching the high 90’s, Severino has the ability to be a front-end pitcher at the Major League level. He has the potential of replacing any of: Masahiro Tanaka, Ivan Nova, CC Sabathia or Michael Pineda, all of whom have had recent injury concerns. Why:Because Carlos Beltran is really old, the Yankees’ middle of the lineup is really suspect and Aaron Judge has the potential to be really good. 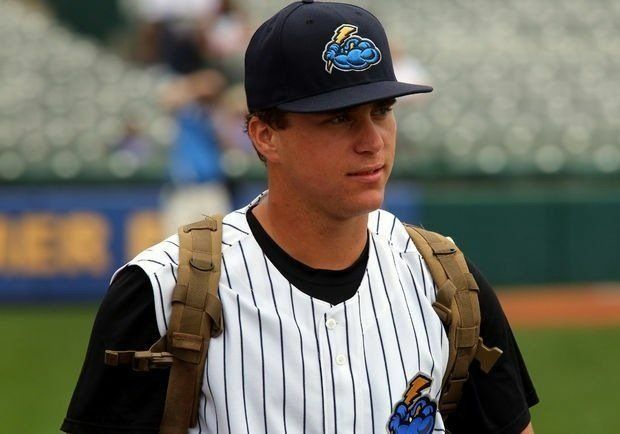 Judge is anywhere from the first to the fifth best prospect in the system depending on who you ask, but he’s the top offensive prospect with a chance of making the majors in the next two years (McCann, Teixeira, A-Rod and Headley are all signed through 2016, which means Gary Sanchez is unlikely to make any sort of impact before 2017.) 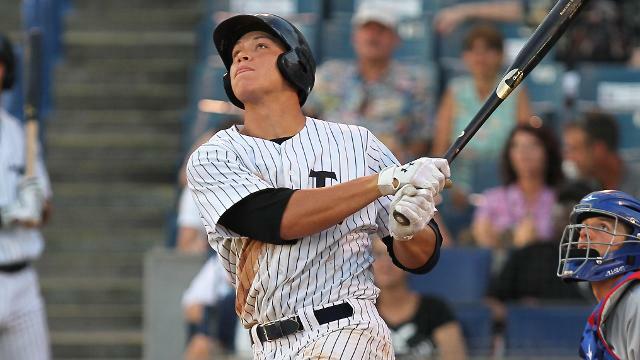 Judge has the potential to demonstrate prolific power, but instead has shown patience and line drive capabilities, a particularly dangerous combination if he can combine both traits. Judge makes the roster sometime in 2016 if the offense is struggling (high potential) if Beltran can’t play everyday (very likely) and if he can conquer AA and AAA during the better part of his next two seasons, the hardest of his challenges ahead. Why: Because he’s ready and because Stephen Drew is not a long-term solution. Refsnyder is the most major league ready hitter in the Yankees’ system and would likely start at second base on Opening Day if not for Drew’s signing. Refsnyder was on Arizona’s championship team in the College World Series just two years ago, but like many college hitters, he has advanced through the minors quickly. 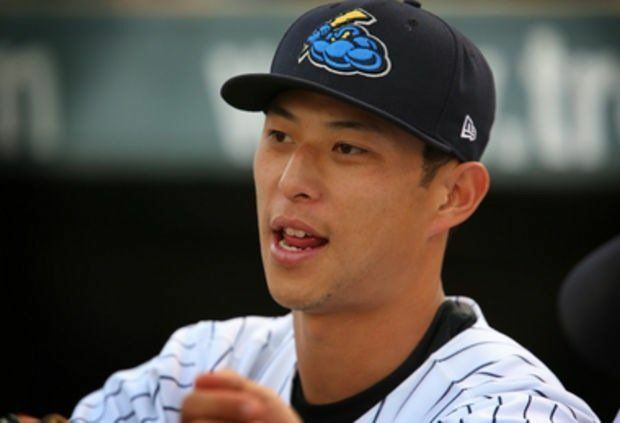 Last year, Refsnyder hit through AA and AAA, posting combined splits of: .318/.387 with 14 HR, 63 RBI and nine stolen bases in 515 at bats. With a MLB ready bat, the only problem will be finding out where to place Refsnyder as a rookie. Drew is going to start at second base, but if he struggles, the Yankees have very little reason to give him frequent at bats. Didi Gregorius is no guarantee at shortstop (Drew can slide over if need be) and Carlos Beltran is an injury risk in right field, somewhere Refsnyder may be able to play instead of second base (his college position). So it’s very likely Refsnyder will get his shot somewhere in 2015 and he has the bat to make a solid impact. Why: Because there’s always a market for a dominant lefty reliever and Andrew Miller might be busy as a setup man. Lindgren was drafted in 2014 and discovered an uptick in his fastball when he moved from the rotation to the bullpen last season. With a heater capable of reaching into the mid 90’s, Lindgren was positively dominant across four levels of the minors last season, posting a 2.16 ERA, with a 1.00 WHIP and .135 BAA in 25 combined innings. Lindgren ended up throwing his final 11.2 frames for AA Trenton and struck out a whopping 48 batters over the course of the year. With no plans of moving him back to the rotation, and with a nasty slider to accompany a solid fastball, Lindgren will likely start the year in AA and be MLB ready sometime in 2015 as a potential MLB bullpen addition. If Miller ends up as the permanent setup man or if the Yankees simply want to roll with two left-handed relievers, there is a spot for Lindgren in the Bronx next season and he just has to continue pitching as well as he did in 2014 in order to get an opportunity.